I am working on a couple of streetscape/Main Street redevelopment projects and it's definitely focused my attention on the ways in which trends of street furnishings get adopted and perpetuated through environments. I think we all know about the unfortunate 'cobra head' and the ubiquitous 'acorn' light fixture - meant to span the utilitarian and neo-historic continuum of streets. Some research along these lines has led to a few interesting fixtures... building on some old posts (here and here) that scratched the surface of this idea. 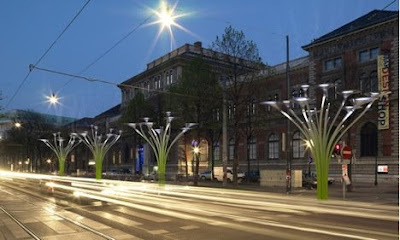 Street lighting for the 21st Century, is perhaps the theme. 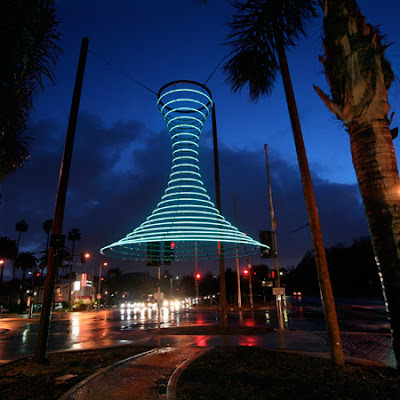 It is refreshing to see some alternatives popping up through artists, designers, and manufacturers breaking the mold and looking at some different forms, as well as more energy efficient and long-lasting fixtures. Is this a case of needing a paradigm shift in what is acceptable and accepted by clients - as well as what is offered up by designers. While both of the communities I'm working in right now are smaller towns - both have a anti-provincial and innovative spirit that has expanded our thinking as designers. 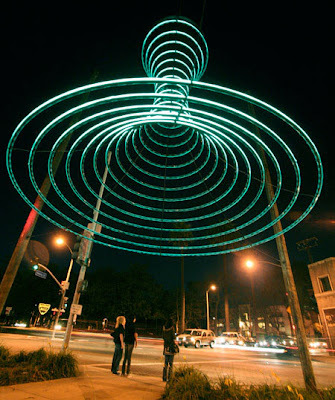 Is this an opportunity to adopt a new style - not something non-contextual or overly urban, but something that is reflective of the unique spirit of community? Sure, although all of these aren't appropriate, something new, sustainable, and different, just may be. 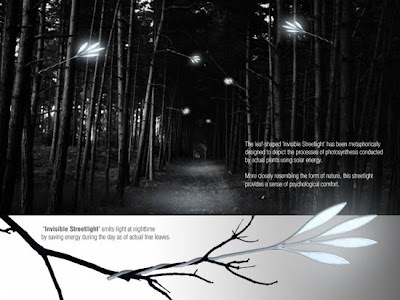 Second is brand new, from The Design Blog, Invisible Streetlight is an interesting concept by designer Jongoh Lee. 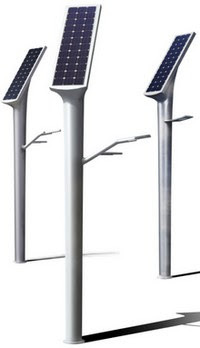 Another recent bit of news that Anchorage, Alaska is going to install LED Streetlights... which is definitely new, as LED technology has slowly crept into all facets of lighting, but not streets - until now. So this examples are remarkably unremarkable... the energy savings and sustainability are laudable. But as I've said, wrap the green in a well design package, and it's just even better. A couple of sexier and sustainable versions. 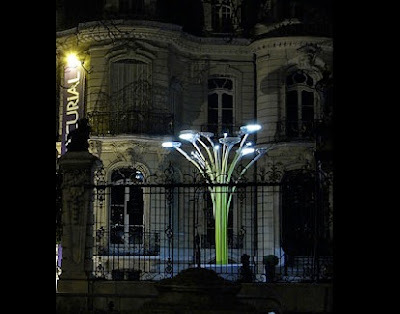 Starting off is the Autonoma, via Treehugger, by French designer Mauricio Clavero: "This solar public lighting pole is totally autonomous and can be placed in any isolated area where electricity is not available. 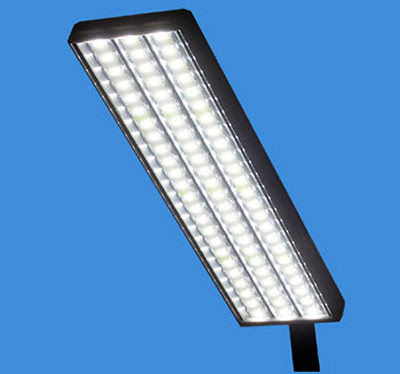 Built with power LEDs which offer lighting performance and energy saving it also can be programmed. 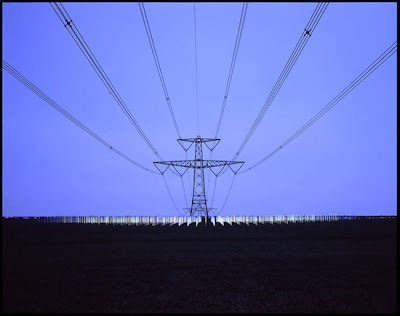 It also includes a motion detector, so when a pedestrian comes close the light intensity of the pole raises to full power, and decreases to a third to save energy when there is nobody around. 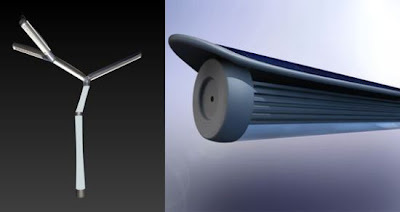 It comes in two versions : urban and country side." 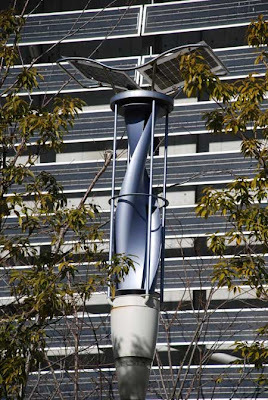 Another, via Interactive Architecture, a "...wind powered streetlight from the Panasonic Center in Tokyo..."
An oldie as well as a more artistic and poet gesture, which I still think has some positive ramifications for using residual EMF to power flourescent tubes... Tropolism led to Pruned, which led to a Richard Box installation called Field: "The project involved over a thousand fluorescent bulbs “planted” underneath high voltage AC transmission lines. Unwired, the bulbs drew energy from the surrounding electromagnetic radiation and lit up..."
Finally, via The Design Blog, some more organic and flexible lighting: "Created by industrial designer Doron Hadar, EcoTreeCity is an ambitious public lighting project that uses integrated freestanding solar element that can produce energy even in extreme conditions like the northern countries that get less hours of light. 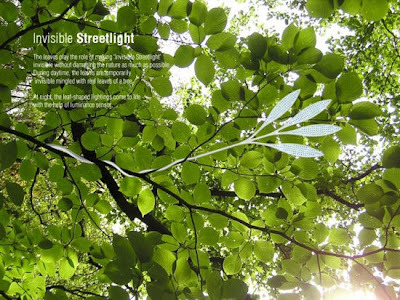 Thanks to a flowing independent form, the light can be randomly put together anywhere making each light unique like a real tree." 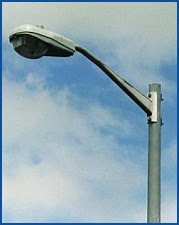 Also, check soon for a related post on some hot in-pavement lighting options. 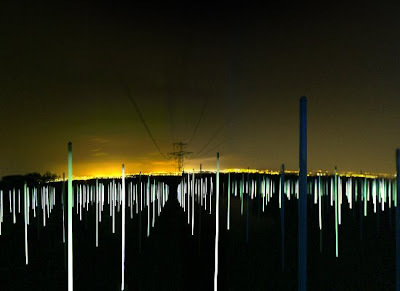 Explorations in landscape architecture and urbanism, with a focus on aligning theory with practice. Jason King is a landscape architect and Principal of TERRA.fluxus in Portland, Oregon, and currently is in the doctoral program at Portland State University in Urban Studies.